On the Fourth Day of Blogmas, my true love gave to me, a full tray of delicious cookies! 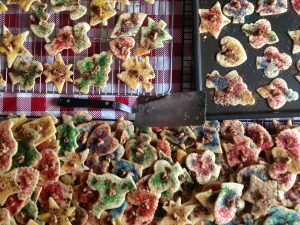 Ever since I can remember, my family has made sandtart cookies for Christmas. 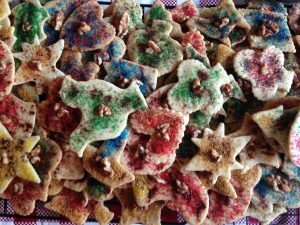 If you’ve never had them, sandtarts are a very thin and light cookie, typically decorated with colorful sugar-sprinkles, cinnamon, and a walnut. 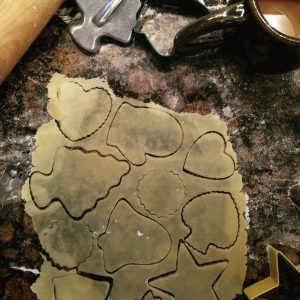 Usually sometime during the week before Christmas, my grandparents would come over, and we’d set up an assembly line of rolling, cutting, decorating, and baking. We’d make a few dozen, and those would be our Christmas dessert. Unfortunately, my grandpa passed away a few years ago, and my grandmother’s physical and mental health do not allow her to continue baking, or even coming over to our house. This only stopped us one year, though, and my mom, dad, brother, and sister and I continue the tradition in my grandparents’ honor. This is one of those traditions I fully plan to carry over to my own family one day. I can hardly imagine a Christmas without sandtarts.